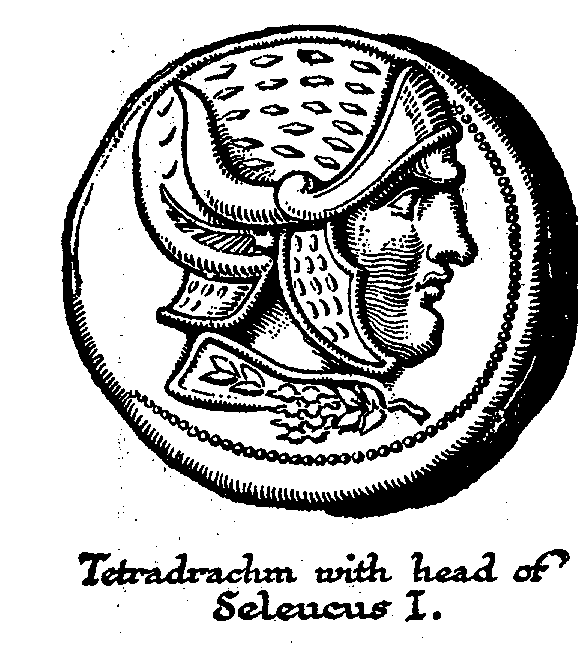 Tetradrachm with head of Seleucus I. From this welter of crime there presently emerged three leading figures. Much of the old Persian empire, as far as the Indus eastward and almost to Lydia in the west, was held by one general Seleucus, who founded a dynasty, the Seleucid Dynasty; Macedonia fell to another Macedonian general, Antigonus; a third Macedonian, Ptolemy, secured Egypt, and making Alexandria his chief city, established a sufficient naval ascendancy to keep also Cyprus and most of the coast of Phoenicia and Asia Minor. The Ptolemaic and Seleucid empires lasted for a considerable time; the forms of government in Asia Minor and the Balkans were more unstable. Two maps will help the reader to a sense of the kaleidoscopic nature of the political boundaries of the third century B.C. Antigonus was defeated and killed at the battle of Ipsus (301), leaving Lysimachus, the governor of Thrace, and Cassander, of Macedonia and Greece, as equally transitory successors. Minor governors carved out smaller states. Meanwhile the barbarians swung down into the broken-up and enfeebled world of civilization from the west and from the east. From the west came the Gauls, a people closely related to the Kelts. They raided down through Macedonia and Greece to Delphi, and (227 B.C.) two sections of them crossed the Bosphorus into Asia Minor, being first employed as mercenaries and then setting up for themselves as independent plunderers; and after raiding almost to the Taurus, they settled in the old Phrygian land, holding the people about them to tribute. (These Gauls of Phrygia became the Galatians of St. Paul’s Epistle.) Armenia and the southern shores of the Black Sea became a confusion of changing rulers. Kings with Hellenistic ideas appeared in Cappadocia, in Pontus (the south shore of the Black Sea), in Bithynia, and in Pergamum. From the east the Scythians and the Parthians and Bactrians also drove southward… . For a time there were Greek-ruled Bactrian states becoming more and more Orientalised; in the second century B.C. Greek adventurers from Bactria raided down into North India and founded short-lived kingdoms there, the last eastward fling of the Greek; then gradually barbarism fell again like a curtain between the Western civilizations and India. 23.5 Was Alexander Indeed Great?